You can lower blood cholesterol levels in a healthy way by improving your diet by including fruits, vegetables and other cholesterol-reducing foods. Plus, avoid animal fats and meat products containing saturated fats. Cholesterol is a fatty substance produced by the liver. It is important for normal functions of the body but having high levels of cholesterol in the bloodstream raises the risk of developing atherosclerosis, cardiovascular conditions, angina, stroke, etc. 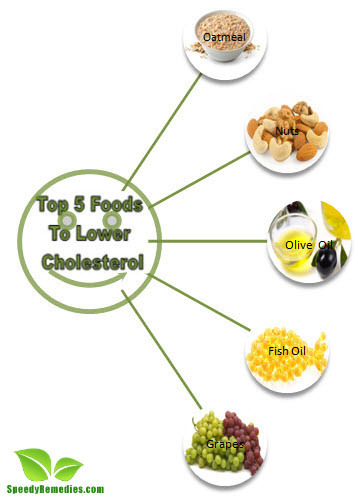 Thus, here is a list of top five foods that are helpful in reducing cholesterol. Oatmeal is rich in fiber, which binds with bile components and prevents their re-absorption. Hence, soluble fiber helps lower blood cholesterol, especially LDL or low-density lipoprotein. Therefore, oatmeal, oat bran, and whole oat flour are considered useful in this regard. You can take about one to one and a half cup of oatmeal in a day. Furthermore, you can have rice bran, barley, peas, beans, and prunes. Moreover, soluble fiber found in apple pulp, strawberries, and citrus fruits (both juice and pulp), is beneficial for controlling blood cholesterol levels. Eating a handful of nuts can prove beneficial in controlling blood cholesterol. They are rich in phytonutrients and fiber. Walnuts, in particular, contain polyunsaturated fatty acids that help lower serum cholesterol. Unlike saturated fatty acids, polyunsaturated fatty acids do not leave low-density lipoproteins while being transported to the tissues. So, you can consume almonds, walnuts, peanuts, pecans, hazelnuts, pistachio nuts, and so on in moderation (nuts are high in calories), that is, about 1.5 ounces to reduce the risk of heart disease. Make sure you munch on raw and unsalted nuts, though. Nuts and seeds are also rich in plant sterols or stanols (phytosterols) that ought to be included in a low-cholesterol diet. Fruits, vegetables, grains, and legumes, too, are good sources of plant sterols that prevent cholesterol from being absorbed in the blood and letting it go out with the waste. These phytosterols have almost the same basic structure as cholesterol. You can also opt for yogurt drinks, margarines, orange juice, and other foods fortified with plant sterols or stanols. It is suggested to replace saturated fats with polyunsaturated fats as saturated and trans fats increase blood cholesterol levels and help in the formation of plaques in the arteries. Thus, saturated fatty acids are associated with high blood cholesterol and heart disease. Polyunsaturated fatty acids, on the other hand, are considered healthy. They reduce bad cholesterol (LDL) and increase good cholesterol (HDL). Moreover, they contain essential fatty acids including omega-3 and omega-6 fatty acids. In addition, they contain a hormone that sends a signal to the brain when your stomach is full, thereby preventing overeating and assisting in weight loss. Apart from olive and canola oil, polyunsaturated fatty acids can be found in plant oils like that of sesame, corn, soy, safflower, sunflower seeds, etc. Make sure you take these oils in moderation. Fatty fish and fish oils have high levels of essential fatty acids (omega-3 fatty acids EPA and DHA) that help reduce blood cholesterol (LDL), high blood pressure, and the risk of developing blood clots. So, you can have salmon, sardines, mackerel, herring, trout, halibut, albacore tuna, etc. The American Heart Association recommends at least two servings of fatty fish in a week. Each service consists of 3.5 ounces of cooked, or almost 3/4th cup of flaked fish. Being packed with linoleic acid and gamma linoleic acid, evening primrose oil, too, assists in lowering cholesterol and preventing the formation of plaques in the arteries. Grapes contain compounds like resveratrol and pterostilbene that can help reduce cholesterol and triglycerides. They affect an enzyme that regulates blood fat cells. Dark grapes have better cholesterol and cancer-fighting properties. In addition, there is a popular belief that raw garlic is an excellent cholesterol-lowering food. It is believed that this antioxidant-rich food prevents the oxidation of LDL, thereby avoiding a buildup in the arteries. However, certain studies have shown that these cholesterol-reducing effects of garlic tend to be temporary. Apart from diet, you need to make some lifestyle changes and reduce excess weight to reduce LDL and raise HDL. You can engage in exercise and physical activity such as swimming, riding a bicycle, taking a brisk walk for at least half an hour daily. Weight management is particularly important for those with large waist circumference, for example, men with waist measuring 40 inches or more and women with waist measuring 35 inches or more.